How many times have you tried to get out of that funk? You know that low energy, uninterested, can’t seem to push pass this ‘feeling’ state. You wholeheartedly make an attempt to pursue that dream or that purpose, only to stumble upon that funk again. What if I told you that that state of nothingness is fueled by your inner fears? For many, it’s the Fear of failing. While for others, it’s that lingering thought that they will never be ‘THAT’ great. According to an article written by Dr. Karl Albrecht Ph.D. posted on www.psychologytoday.com, there are 5 fears that are common among humans. Extinction—the fear of annihilation, of ceasing to exist. This is a more fundamental way to express it than just calling it “fear of death.” The idea of no longer being aroused a primary existential anxiety in all normal humans. Consider that panicky feeling you get when you look over the edge of a high building. 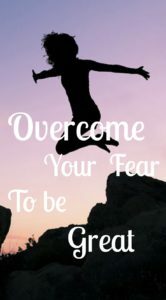 Whatever fears that are holding us back must be conquered before we can operate greatly at whatever we set out to do. 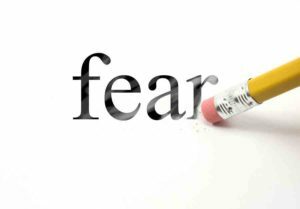 Fear is an anxious feeling, caused by our anticipation of some imagined event or experience. The key words in this definition are “FEELING” and “IMAGINED”. These words imply that our fears aren’t tangible, but are perceived notions that we have conjured up in our minds. Last I checked, we possess the power to control our thoughts and later our actions. What if we replaced these feelings and imagined experiences with positive thoughts and emotions? What if daily we affirm what we truly believe in? Our days can begin with us declaring that today we will complete whatever task is on our to do list that is needed to be done to later accomplish that goal that we have set. We can command our mornings and command the outcome of our days. By affirming positive thoughts and converting these thoughts to actions, day by day we will be closer to accomplishing our goals. Through affirmation, we can be great. Many persons scoff at the cliche term “fake it until you make it”. However, according to Cosmetic Surgeon Maxwell Maltz, author of the self-help book Psycho-Cybernetics written in the 1960’s, it takes 21 days to break a habit. Imagine if for 21 days we affirmed and acted positively? The possibilities of the things we would achieve would be endless. My charge to you as you end this article is to command your days and act accordingly. With hard work and persistence, you will rise up out of that funk, combat fear, and claim your ability to be great. « Why are more educated women single?